Carlos Alberto Gomes Parreira (born February 27, 1943, in Rio de Janeiro) is a Brazilian football manager. Parreira supports Fluminense, and he has won two important League titles for the club: The First Division Brazilian Championship in 1984 and the Third Division in 1999. About the latter title, Parreira has said that this was personally the most important trophy of his career, even more so than Brazil's World Cup triumph, as the club he loved was facing near-bankruptcy and became very close to extinction at the time. He is regarded as a hero by Fluminense's supporters. Parreira is noted for having been one of only two coaches that has led four national teams to the World Cup: Kuwait in 1982, United Arab Emirates in 1990, Brazil in 1994 and 2006, and Saudi Arabia in 1998. The other coach, Bora Milutinovic, surpassed this record when he led a fifth team in 2002. He was also involved to some extent with the 1970 championship team for Brazil, which he claims was an inspiration for him to aspire to be a national football coach. Parreira is on course to equal this record come June 2010 as he will guide the Bafana Bafana in the 2010 finals on home soil. In 1997, Parreira coached the MetroStars of the American Major League Soccer. He also coached Fenerbahçe in Turkey and won a Turkish League Championship. Parreira was also in charge of Corinthians in 2002, which gave him two of the most important national trophies of 2002: The Brazilian Cup and the Torneio Rio-São Paulo, besides being runner up at the Brazilian League. When coaching Saudi Arabia at the 1998 World Cup in France, he was fired after two matches, one of two managers to be sacked during the tournament. 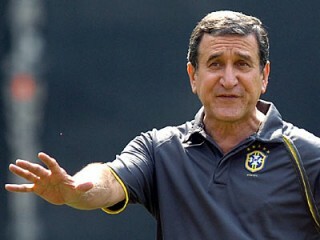 Parreira repeatedly turned down offers to coach Brazil again between 1998 and 2002 World Cups. In end of 2000, when the team was in turmoil after firing Vanderlei Luxemburgo, he refused the post, stating that he did not want to relive the stress and pressure of winning the World Cup again. There were public cries again to replace Luiz Felipe Scolari for Parreira in July 2001 when Brazil lost two matches to Mexico and Honduras in its title defense at the 2001 Copa America in Colombia, specially after the last minute invitee (replacing Argentina who dropped out one day before the kickoff) Honduras defeated 2-0 and eliminated the favorite Brazil in quarterfinals round on July 23, 2001. Through this time period, Parreira, only stated that he would indirectly assist Scolari in 2002 campaign. After the 2002 World Cup, Parreira took part in drafting a technical report of the tournament. He was named coach along with Mario Zagallo as assistant director in January 2003, with the goal of defending their World Cup title in Germany 2006, but on July 1, 2006 the favorite Brazil was defeated and eliminated 0-1 by France in quarterfinals. After Brazil's exit from the World Cup, Parreira was heavily criticisized by the Brazilian public and media for playing an outdated brand of football and not using the players available to him properly. Parreira subsequently resigned on July 19, 2006. He coached Brazil to victory in the 1994 FIFA World Cup and was the coach of the South Africa national football team until resigning in April 2008. On October 22, 2009 it was announced he will return as head coach of the South Africa national football team. He announced a verbal agreement with the South African Football Association on October 23, 2009.